In what appears to be a record, two different teams of astronomers have confirmed the existence of a seventh planet orbiting a dwarf star 2,500 light-years away. And incredibly, all seven planets are caught in a tight orbit closer than the Earth's distance to the Sun. 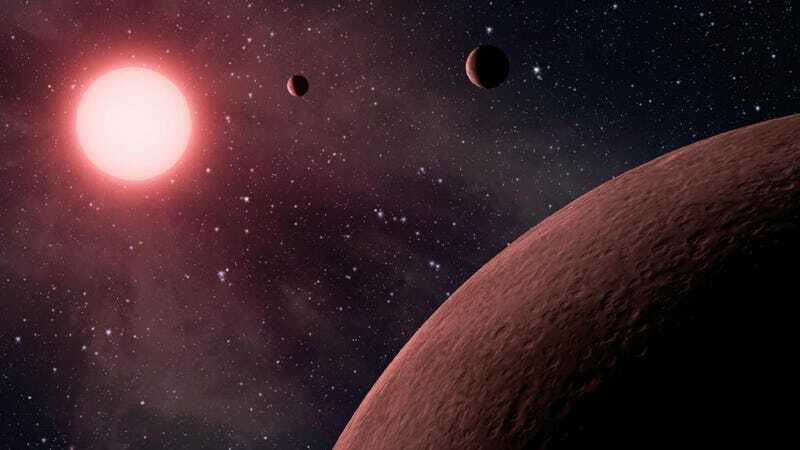 The solar system in question is called KIC 11442793, and it was previously known to host three planets. A new paper, which is set to be peer reviewed in the Astrophysical Journal, describes the other four, including the recently discovered seventh planet. The other team to discover the seventh planet consists of volunteers using the Planet Hunters Website. The discoveries were made with Kepler data and by using the transit method. Interestingly, the solar system closely resembles our own, despite it being so compact. It's got five terrestrials planets on the inside (including two super-Earths) and two gas giants on the outside. The outermost planet is an orbit of 1 AU (the distance of the Earth to the Sun). The newly discovered planet, which is 2.8 times the size of Earth, is the fifth out with an orbit of 125 days. There is another candidate for most crowded solar system, however: HD 10180. Some astronomers claim it has nine planets. There's also GJ 997C, which might also have seven planets. Read both papers at the preprint server, arXiv: "The Planetary System to KIC 11442793: A Compact Analogue to the Solar System." & "Planet Hunters VI: The First Kepler Seven Planet Candidate System and 13 Other Planet Candidates from the Kepler Archival Data." Top image: Artistic impression of a different solar system, KOI-961. Image Credit: NASA/JPL-Caltech.